Installing medium voltage power cables underground comes with its own set of challenges. From the engineering standpoint, there are several factors one needs to consider before installing the cable. The most overlooked if not well understood factor is the type of power cable that’s required for the application and when to ground the cable’s neutral wire. Take a look at Figure 1. 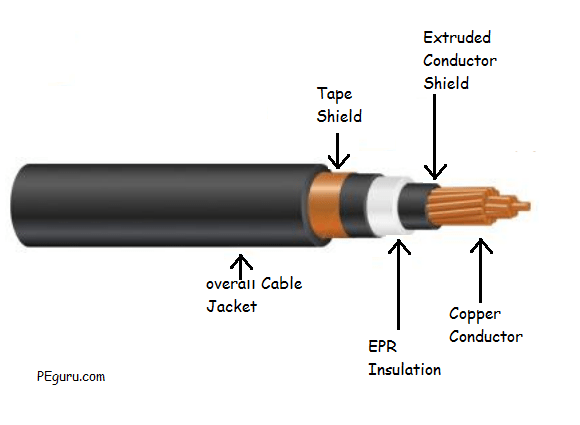 This type of cable is used by the utilities for power distribution via underground raceways. It contains either the 1/3rd size neutral (relative to a phase conductor) when it is used for three phase supply or a full size neutral for single phase supply. When the concentric neutral in this cable is grounded at both ends, there is a possibility of circulating currents in the neutral. This can happen either due to unbalanced currents in the 3-phases, due to magnetic induction from the long run, or due to a short circuit involving a line to ground fault. In any case, this current carrying neutral constitutes the fourth cable in the set of three cables inside a conduit. Derating the cable for this additional wire is necessary. Sometimes the concentric neutral conductor on top of the insulation is not required, typically when supplying power to an industrial load (which predominantly contains three phase loads). 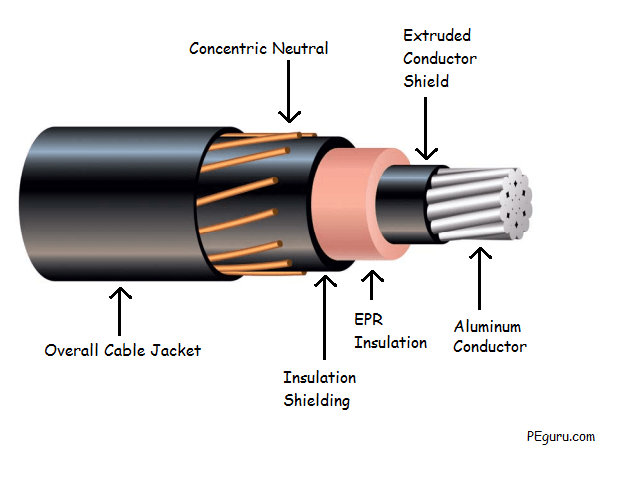 There are cables like the one shown in Figure 2 that have a tape shield over the insulation in place of a concentric neutral conductor. These cables cost less to manufacture. Since the tape shields sole purpose is to shield the cable and since it is not rated to carry the unbalanced neutral current or the short circuit current, it is by design required to be grounded at one end of the cable only. However, to afford safety for people working on these cables, it is grounded at both ends. To protect the cable, a dedicated ground conductor is run with the other three phase conductors in the same conduit. For utility power distribution application: Use power cable with concentric neutral conductor. Ground neutral at both ends. For industrial power distribution application: Use power cable with tape shield. Run a dedicated ground cable. Ground tape shield at both ends. Please tell me , in a 33 kV OHL distribution system , if single core copper U/G cable are used for crossings with 1 no cu ground wire for earthing continuity, Should the cable end terminated at the crossing ends bonded on both sides in case 1. Cu Tape shield 2 . Copper concentric neutral and . Please explain the reasons , advantage and disadvantage. It is SOOOO not that case that there is always a neutral, in fact with MV cable systems there is RARELY a neutral. There is also rarely a reason to have a neutral. Most MV cable circuits are feeding 3 phase transformers with a delta winding. Running a neutral to those locations is a waste of copper/aluminum. Both ends are grounded for safety reasons. There is always a separate neutral for current carrying purposes. I think it was deliberate (not a misunderstanding). There are two feeders that come out of a substation (24.9kV) in concrete encased ducts. The cables are 750MCM CN and multi-point grounded – in every vault that they go through. At the substation end, the cable neutrals are bonded to the substation ground bus (and of-course the grounds in every vault). The last vault is about 2000 ft away and the the feeders go aerial after that. This separate 4/0 conductor is also terminated at the substation to the ground bus and to the ground inside the last vault (so I guess you could call it a ground conductor). But why would you need it if you have multi-point grounding of the cable neutrals?? We’re planning to extend the underground feeder and also add circuits…this existing setup is throwing me off a bit. Should we extend the ground/neutral with the feeder extension? Do we need to add extra ground conductor for new circuits?? It seems like a waste with CN cables. Unfortunately the engineer who installed the original system is not available any more to share his thought process. Con Neutral Cable AND a separate neutral is indeed an odd duck. If you are SURE it is intended to be a neutral (and not a ground) then I can think of a couple of reaons why it might happen. The first is that it is possible (Under the right conditions) for neutral curents to exceed the phase currents, and the Conn neutral might have been undersized by itself. A second would be if (assuming the neutral is a MV cable) the 4 wire system was ungrounded or impedance grounded. In that case the neutral would also need to be insulated for medium voltage, and then the concentric “neutral”, just gets used as a ground. A third option ( and IMO most likely) is that person A sees that this is a 4 wire circuit, and orders Con Neutral cable. Later Person B sees that this is a 4 wire circuit, and sees that Person A only ordered 3 cables, and so orders up a neutral as well. Is there any reason to have a separate neutral conductor when your feeder is made of concentric neutral cables? I am looking at a feeder that is designed and constructed just like that. That is why there is a dedicated ground conductor in the pipe or race way. The only fault(s) for which having it grounded at both ends makes a real difference are load side ph G Faults, assuming a 3 ph circuit, you have 3xthe shiled + the dedicated ground to conduct those currents. For faults in the cable, you are blowing the jacket no matter what. Jim, if this has been the typical practice then how do you accommodate for the short circuit current in the (tape shielded) neutral? You will likely blow the cable jacket. That is not the case. Typical practice is to bond the shiled at both ends.